There is one thing you can clean that will make your entire home look cleaner. This is your kitchen. I’m sharing some of my best clean kitchen tips and the ways I keep my kitchen spotless all day. With floor plans being more open these days it’s not unusual that your kitchen could be seen from any of your normal living spaces. While this is great to make small homes look larger, it leaves us with an unfortunate problem. Any mess in the kitchen can make the entire home feel messy too. There are a few key things that you can do to keep your kitchen spotless in between cleanings to keep your whole home cleaner too. These are little habits and actions that make all the difference. They can also save you loads of time during your big cleanings. The number one trick to keeping a spotless kitchen is organization. Make sure every single thing has its place and it gets put back when not being used. The second part to this is to organize your kitchen in such a way that it makes it useful to you while you are cooking. For instance, you might keep your coffee cups and coffee above your coffee pot. Likewise keep baking dishes, pots and pans, in a cabinet near your stove and oven. This keeps searching while you are cooking to a minimum. Avoiding clutter on your countertops will make your entire kitchen look cleaner. If you have all your appliances on your countertop plus a knife block and other kitchen related items it will look cluttered. Keeping only a couple of small appliances on your countertops and storing the rest away will help your kitchen look cleaner. If you have plenty of cabinet space and it’s easy enough for you to do so put all of your small appliances away. Having nothing on your counters not only makes your kitchen look cleaner it also makes it look larger. My kitchen counters always have small pads of paper and pens on them. If your kitchen counter becomes a hot spot for paper, scissors, pens, and other objects you might consider creating a junk drawer. The junk drawer is one smaller drawer where extra things can be hidden away and kept off your countertops. It’s also a great place to store extras that anyone in the family might need. For instance in our junk drawer we have our corkscrew, some pens, a pad of paper, kitchen shears, and random kitchen tools. We rarely use this things so I keep them in a spot for just in case I need them. When I was growing up my mother had a junk drawer. It was stocked with pens, pencils, a pair of scissors, small pads of paper, and other things. When I needed any type of office supply I knew I could find one in this drawer. Of course it’s helpful to go through the drawer every couple of months and clean it out. This way it doesn’t get too crowded in there. Also you can determine what you need to keep around and what can get tossed or donated. When you are cleaning your kitchen make sure you work from top to bottom. This will make sure you are not needing to repeat work. Start with wiping your upper cabinet doors down and dusting the top of your fridge. Wipe down the countertops, fronts of appliances, and fronts of lower cabinets. Finish by sweeping and scrubbing down your floors. Cleaning your kitchen this way allows you to get everything clean without needing to wipe down counters twice or sweep twice because you cleaned the top of your fridge last. The best clean kitchen tip I have found in keeping a spotless kitchen is to clean while you cook. Once you are done with a pan – rinse and put the pan in your dishwasher. Even wiping down your counters after use will go a long way to keeping your kitchen cleaner. Cleaning as you cook and prepare food also helps you to save time later when you are cleaning your kitchen up for the night. You’ll more likely have just dinner dishes and one pan as opposed to all that plus cutlery, mixing bowls, and cutting boards that will also need to be put away. Empty your dishwasher in the morning and run it every single night. Keep dirty dishes out of your sink and out of sight by loading your dishwasher throughout the day. If you don’t dirty enough dishes to run your dishwasher daily, just run it when it’s full and make sure to empty it when it’s done. This will keep your sink and counter clutter to a minimum. During the day as needed wipe your crumbs off your counters and into your sink. These small wipe downs will help keep crumbs off your floor in between cleanings. Not to mention, forming the habit of quickly wiping your counters into your sink several times in a day allows you to go longer in between large time consuming cleanings. I am always wiping down my counters and it really helps me to keep my kitchen looking spotless. I have two cats so I swiffer my floors everyday just to keep them free from fur. There is one trick that will save you time and money with this. Go to the dollar store and get a bunch of those fuzzy socks. You can put them on your swiffer and they will pick up fur off hard flooring quickly. Once you are finished pull the sock off inside out to trap the fur and wash it with your normal laundry. Now you can reuse them, save loads of money, and reduce your waste easily. When it comes to cleaning my appliances I ditch expensive or chemical filled products that will be near my food. I use dish soap and a microfiber cloth depending on what I am cleaning I might use a soft scrubber too. Use the soapy cloth to do the initial wipe down of the appliances then rinse the soap out of the cloth and wipe down your appliances to remove the soap. I find this leaves my appliances shiny and without any residue at all. The dish soap will cut through any burnt on food or grease splatter easily. It’s also safer to use than most heavy duty cleaning products that not only put chemicals into the air you’re breathing while cleaning, but they aren’t safe around food. Finally, make sure you empty your trash and recycling every single day. This will reduce any smells in your home and make your home look cleaner. Use smaller trash bags and a smaller can if necessary. You can also save some money by instead putting a hook under your sink and just using the plastic bags you get from the grocery store if you don’t use reusable bags. 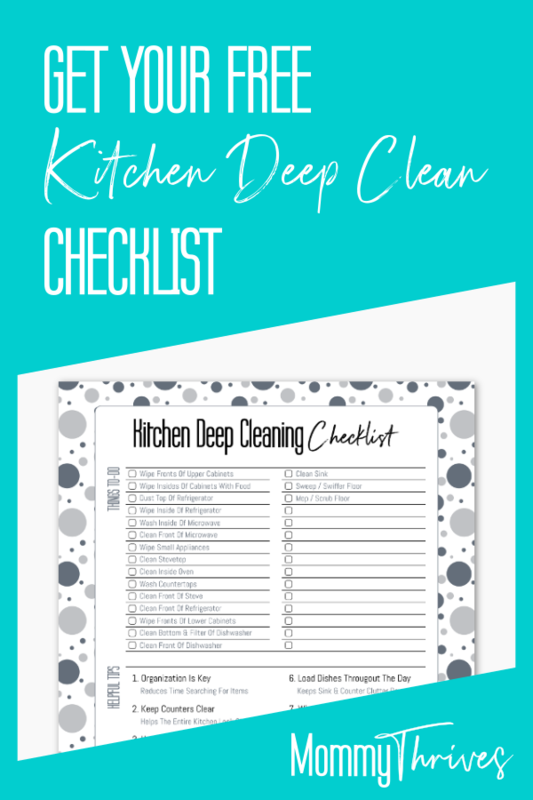 I created this kitchen deep cleaning checklist to help me remember all the little things that should be done. About once a month I go through and do what’s on this checklist from top to bottom. It takes me about an hour to accomplish. Get your FREE copy by subscribing below. What do you hate about cleaning your kitchen? Let me know in the comments below. Follow me on Pinterest for more like this and be sure to pin this to your cleaning boards.